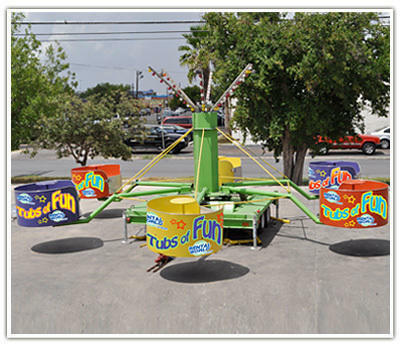 This exciting Tubs of Fun amusement ride will thrill all ages. The spin speed of each tub is controlled by the rider so teens can go at top speed while Mom and Dad can enjoy a slower pace with the little ones.Depending on riders size, up to 24 riders can ride at a time. A great ride for Birthday Parties, School Carnivals, Church Festivals and Company Events. CLICK HERE FOR VIDEO.